U.S. stocks snapped higher Tuesday as markets eased some of the month's brutal losses before the end of October. 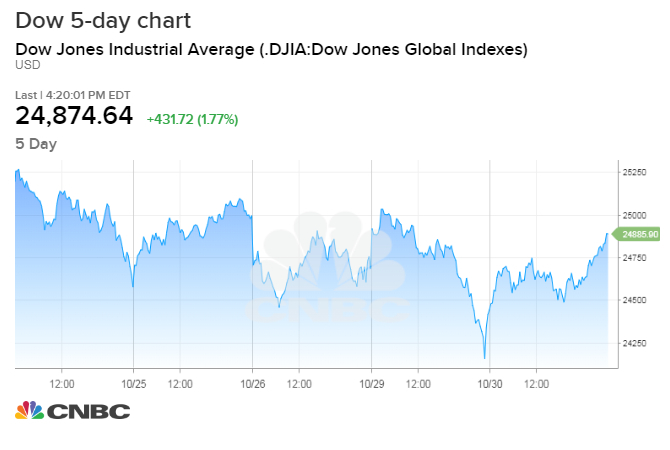 The S&P 500 rallied more than 1.5 percent to close at 2,682.63 as communications, energy and materials stocks carried the index out of correction territory. Shares of Charter Communications, DISH Network and Twitter all rose more than 4 percent each. The Dow Jones Industrial Average surged by 431.72 points to finish at 24,874.64. Goldman Sachs, McDonald's and Boeing all outperformed the broader blue-chip index. The tech-heavy Nasdaq Composite rose more than 1.5 percent to close at 7,161.65. That index climbed thanks to a 5.2-percent rally in Intel and a 4.7-percent gain in CNBC-parent Comcast; e-commerce giant Amazon shed 0.5 percent during the session. The rebound on Tuesday followed a shaky start to the week in the prior session that saw stocks giving up sharp gains. The Dow traveled more than 900 points on Monday. Market participants cited the possibility of more U.S.-China tariffs, a drop in tech stocks and worries over higher interest rates for the decline. After Tuesday's comeback, the Dow is down 5.9 percent this month, still its worst performance since August 2015. The S&P 500 is off by 7.9 percent in October, on track for its worst month since May 2010. On Monday, the S&P 500 closed in correction territory, down 10.2 percent from its record. "Obviously we're in a correction phase of the stock market and I think investors have to realize that," said Bruce Bittles, chief investment strategist at Baird. "The monetary environment has changed. As you can see, even with a 10 percent change in the stock markets, interest rates have barely moved lower." "Typically bull markets are global in scope and the question was: would we follow the rest of the world, or would they follow us? I think we've found the answer," Bittles added. Even with the most recent sell-off, U.S. stocks have generally outperformed overseas indexes throughout 2018. The Stoxx Europe 600, which was little changed Tuesday, is down more than 8 percent for the year. In Asia, the Shanghai Composite has fallen more than 24 percent since January. The Chinese index rose 1 percent Tuesday. Despite the largely bearish tone in October, it is not uncommon for the stock market to end bad months with a rally akin to that seen in Tuesday's session. Since 1952, when the S&P 500 was down 8 percent or more with two trading days left in a month, the benchmark bounced higher 80 percent of the time in those final two days, with an average gain of 2.75 percent, according to Bespoke Investment Group. "If we can get through the week without too many setbacks, then investors may begin to see the light at the end of the tunnel and sense opportunities in the markets, rather than view it with anxiety and fear which has certainly been the case in recent weeks," Craig Erlam, senior market analyst at OANDA, said in a note. Coca-Cola reported third-quarter earnings that topped Wall Street estimates, pushing shares up 1.6 percent. Sales of diet soda and higher prices helped the company top earnings and revenue projections for the quarter, boosting profit by 30 percent. General Electric fell more than 10 percent at its lows, dipping below $10 per share for the first time since 2009. The plunge came after the company disclosed that the Securities and Exchange Commission is expanding its probe into the company's accounting practices. Shares initially moved higher when GE said it would slashits quarterly dividend to just a penny a share, but fell later in the day. The dividend cut was seen as a bold by investors, who took the action to mean new CEO Larry Culp would take dramatic action to turn around the fallen blue chip. The stock finished the session down 8.7 percent at $10.18. Apple unveiled a host of new iPad and Mac computer generations at its annual Brooklyn launch event on Tuesday. The iPhone maker, which will report earnings on Thursday, said the latest iPads will eliminate the home button and include Apple's facial recognition technology that was introduced last year. With 279 of the companies in the S&P 500 having reported quarterly results, profits are expected to increase 23 percent a year earlier, according to FactSet estimates. On Monday evening, President Donald Trump told Fox News Channel that he thinks the U.S. will make a "great" trade deal with China, helping market sentiment somewhat. This follows a Bloomberg News report on Monday that suggested the U.S. could be preparing to announce tariffs on all remaining Chinese imports by early December if talks between Trump and China President Xi Jinping breakdown next month. In economic news, an index of consumer confidence rose to a print of 137.9 this month, driven primarily by a hot labor market and expectations that economic growth will remain solid in the near term. The Conference Board's latest reading is the highest level since September 2000; economists polled by Reuters had expected the index to slip to 136. — CNBC's Sam Meredith contributed reporting.